Barbara Broccoli discusses the future of Bond after Daniel Craig. Patty Jenkins teases a “totally different” Wonder Woman 2, as well as her attempts to get Lynda Carter to make a special appearance. Robbie Amell joins Amazon’s new scifi comedy. Plus, behind-the-scenes of Black Panther, and what’s to come in The Flash’s return. Spoilers now! In conversation with the Daily Mail, Bond producer Barbara Broccoli stated “anything is possible” when asked if the next actor to play James Bond could be a woman or person of color. Patty Jenkins recently spoke to ET Canada about Wonder Woman 2's “totally different” filmmaking approach. In the same interview, Jenkins stated “there’s no lack of trying” in the seemingly Amazonian task of securing Lynda Carter for a cameo. We’ll see. Lynda is one of the dearest people to us, has been a great mentor and dear friend. And we actually desperately tried to get her in the first one and we had the scheduling that couldn’t work, so she’s always been a part of our Wonder Woman family. We won’t say anything yet, but we certainly—there’s no lack of trying. A new featurette explores Black Panther’s comic book origins. Director David F. Sandberg shared a photo from his recent meeting with Zachary Levi in Toronto. Jeremy Renner has wrapped filming. Discussing Film reports perpetual Marvel Netflix guest star Rosario Dawson has signed on for both Daredevil’s third season and Iron Fist season two. 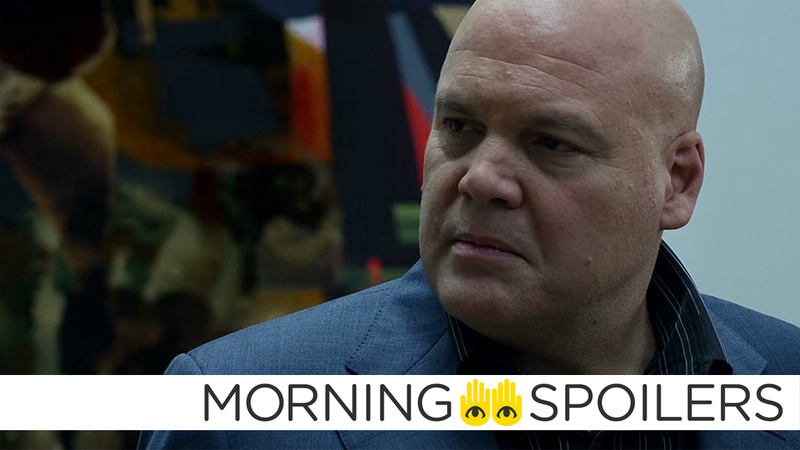 Meanwhile, set photos of protestors holding homemade anti-Wilson Fisk signs seem to indicate the Kingpin is either going to trial for his crimes in season one, or getting released to the general dismay of New Yorkers. Robbie Amell will star in Amazon’s pilot for a single-camera comedy from The Office’s US creator Greg Daniels. According to Deadline, Upload is set in a near-future where humans can upload themselves to the internet after death. The series follows Amell’s character, Nathan, as he grows accustomed to post-humanity. Speaking of trials, meanwhile in Central City, Barry Allen stands accused of murder in the trailer for January 16’s “The Trial of the Flash”. Spoiler TV has images from episode six, “The Scrap Yard of Childish Things.” More at the link. Sax and Happy embark on lonely journey in which Sax stumbles on a new plan to negotiate for his daughter’s release; Happy takes solace in the welcoming arms of another Imaginary Friend. Episode 15 of the seventh is titled “Sisterhood,” according to producer Adam Horowitz on Twitter. Finally, Buddy TV sits down with Gillian Anderson to discuss the new season—unfortunately, this was filmed back at New York Comic Con, so they’re not able to discuss any of those creepy revelations from the season premiere.